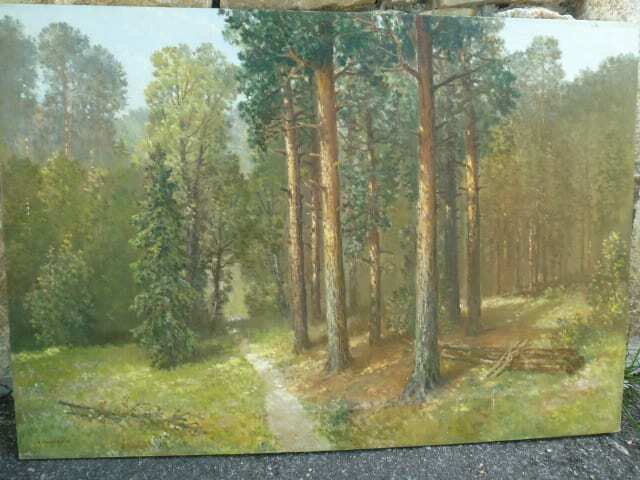 This painting, measuring 27″ x 39″, is signed K. Mackiewicz. It is so easy to get lost in the woods. Great condition and ready to frame. Shipping is at the expense of the buyer. 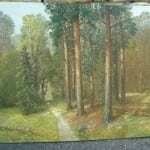 Konstanty Mackiewicz was a Polish painter and scenographer. He started his studies in Odessa, Ukraine, then continued in Penza, Italy 1914-1919, and finally at the Kandinsky’s Studio at the Moscow’s Academy of Painting, Sculpture and Architecture.In 1922, Mackiewicz settled in Lvov where he worked as a scenographer for Lvov’s theater. In 1926, he moved to Lodz, Poland to continue his theater work for the Municipal Stage. 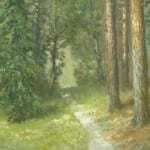 As a member of two noble art groups “Rytm” and “Start”, he exhibited in Poland, Brussels (1933), Paris (1937) – where he won two Golden Prizes, and New York (1939). After the World War II, Konstanty Mackiewicz stayed in Lodz, leading active artistic life. His rich and varied career retained references to Cubism, Futurism as well as Colourism. His legacy stretches from realistic landscapes and still life pieces to abstract images.